A new batch of tempeh was made. 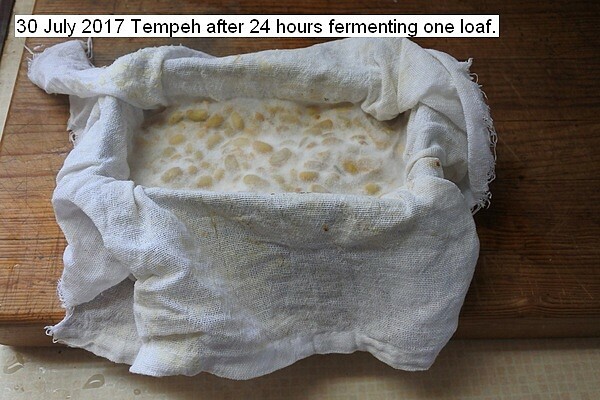 Half a liter of dried soy beans were made into one liter of tempeh,3 loaves, since they swell with the processing. The beans were boiled for 30 minutes and the skins hand rubbed off under cold water,and floated away about five times to completely remove and split the beans. The beans were then placed in a colander and placed in the pressure cooker and steam cooked for 30 minutes. The beans were placed in a mixing bowl and allowed to cool to room temperature. A tablespoon of vinegar was added to make slightly acidic. The starter was added about half a teaspoon full and thoroughly mixed by hand. The beans were then placed in sterilized damp cotton protected molds and placed in the fermenter set at 31C. In 24 hours the fermentation will be complete. Annotated pictures depict the process. Finished product after 24 hours fermenting. 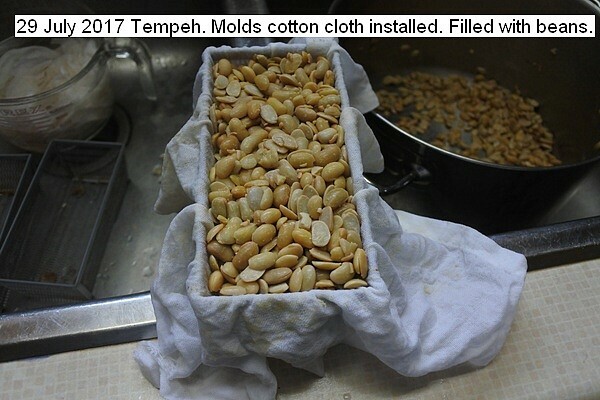 This entry was posted in Uncategorized and tagged 29 July 2017 Tempeh Processing, Tempeh Processing, Tempeh). Bookmark the permalink.